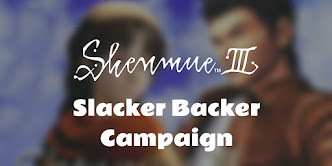 Surprise - Sega is promoting Shenmue again! The association for the promotion of tourism in Yokosuka (the Yokosuka Action Promotion Committee) has miraculously managed to gain SEGA's cooperation to produce a Shenmue-themed tourist booklet entitled Shenmue Chapter One: Yokosuka 'Sacred Spot' Guide Map. 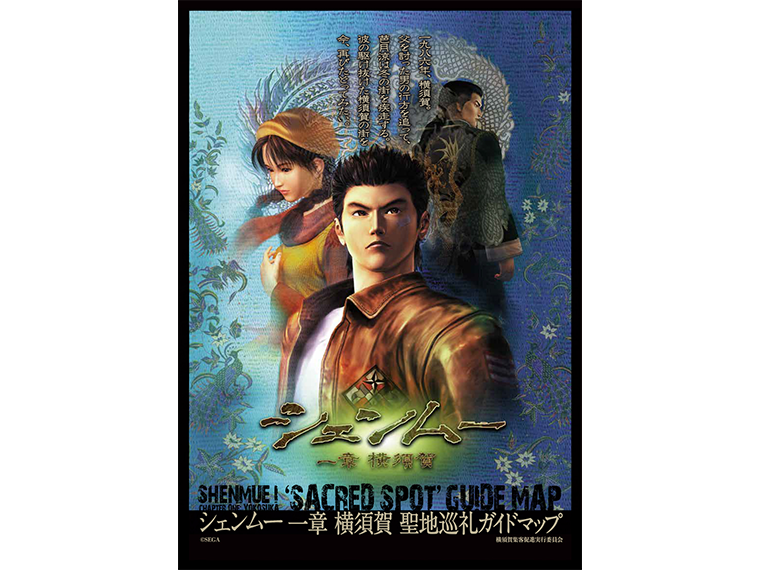 The cover of the Shenmue Chapter One: Yokosuka 'Sacred Spot' Guide Map. 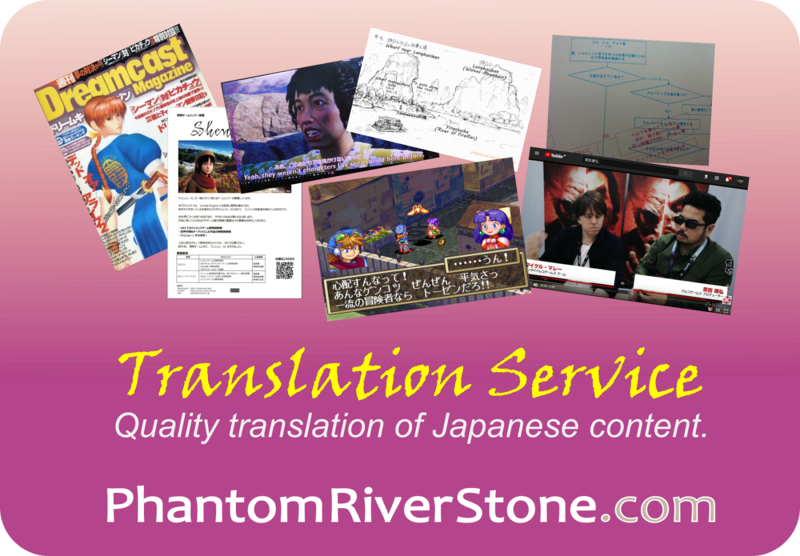 A short description about the guide map has been published on the association's site that is currently in Japanese only, so below is a translation of the text into English. Enjoy! Translation of the piece posted on the official CocoYoko website starts below. Creation of the Shenmue Chapter One: Yokosuka 'Sacred Spot' Guide Map is complete! Enjoy the town and streets of Yokosuka and the world of the game. 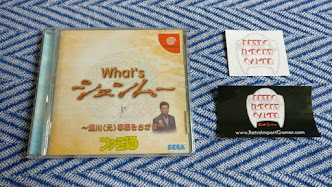 The Yokosuka Action Promotion Committee, with the kind cooperation of Sega Holdings, has created the Shenmue Chapter One: Yokosuka 'Sacred Spot' Guide Map, covering locations that formed the setting for the unfinished epic game "Shenmue Chapter One: Yokosuka" that Sega released in 1999 as a title for the Dreamcast. 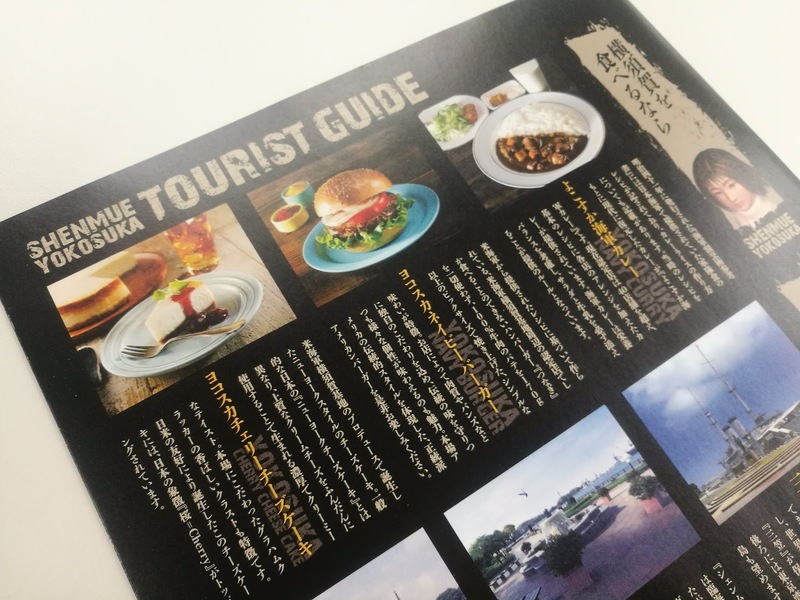 It highlights places of interest from the Yokosuka townscape of 1986 in which Shenmue I is set - shrines, parks, shops and so on - that conceal the essence of that time. We hope you'll take this opportunity to enjoy the world of Shenmue. A sneak preview: Nozomi introduces Yokosuka Cherry Cheesecake, Yokosuka Navy Burger, Yokosuka Navy Curry. Yokosuka tourist information station ("Suka Navi i") in front of Keikyu Yokosuka-chuo station. Tourist information point "Yokosuka Dobuita Station"
[Added by Switch from other sources] Also electronically on the CocoYoko website. Shenmue was released by Sega in 1999 as a Dreamcast title. It faithfully recreated the actual, existing world and the degree of freedom of movement within the world achieved was revolutionary for the time. Since then, it has influenced numerous games, and brought about the 3D open world genre. It is a work that changed history. With realistic performances through the use of motion capture, and full voicing right down to side-characters you run into on the street, the entire townscape, characters and event-based scenes were rendered in real-time polygons. The weather and time changed, and the world created from the changes as time passed from morning through to night, with characters living out their day according to schedules, was outstanding. That high degree of freedom lying behind the world that was created was the forerunner of the open world. OMG! Something tells me that this is a sign of Shenmue Remaster ! It's something I never imagined we would see happen. Is it possible to buy it??? Officially it's a free pamphlet and is not available to order, but I imagine copies of the pamphlet will find their way onto auction sites before too long.